Clancy was found running along a rural highway, emaciated, bleeding paws and a piece of rope around his neck. A good person picked him up and took him to the vet. That is how Clancy came into rescue. Clancy was found running along a rural highway, emaciated, bleeding paws and a piece of rope around his neck. A good person picked him up and took him to the vet. That is how Clancy came into rescue. The people at the vet's office treated his wounds and he went home to recover. Clancy has since gained about 8 lbs (he still only weighs about 45 lbs), has been brought UTD on vaccinations, neutered and has received love, care and some training. Clancy is on the small side for a male bulldog. His is excellent in the crate, and well behaved in the house with supervision. He is very atheletic, but it takes him a few minutes to warm up to new people. He seems good with other dogs, but has not been tested with cats.Once he gets to know you he is a very affectionate young dog. 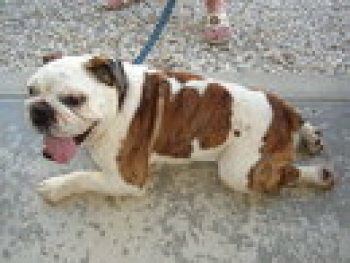 Clancy is going to need a home with some bulldog experience... as he is a power jumper and needs a basic obedience couse. He walks very well on the lead and loves to ride in the car. NO CHILDREN UNDER 12 because of his jumping. We do not adopt further than 2 hours from ST. LOUIS. Please have an application on file. Home Check, Vet Check, Reference Check and adoption fee apply. Clancy is now ready to entertain the possibility of his forever home!